Welcome to the Can you escape 2 guide. 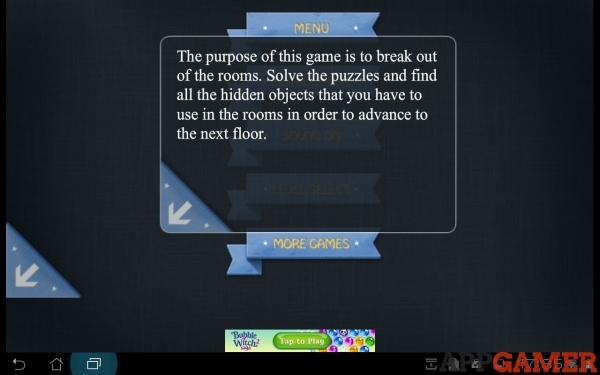 A room escape puzzle challenge game from MobiGrow. This game currenty as 8 levels or rooms that you need to explore and dicover the clues and objects that will help you to eecape each one. Some levels will have more than one view. in the bottom left or right of the room view will be an arrow to take you to the next view if available. Exploring all the views is necessary to find your way out. In the top right of each room is a link to the settings. And in the top left a help link that will show you an advert video before giving you help on solving he clues. Read on in this guide to get a step by step walkthrough of each room.